Last year in August, Twitter uncovered its objective-based campaigns and pricing, which was running in beta mode till now which came live after an official announcement on May 20, 2015. Twitter announced that the objective based campaigns are now available globally to all advertisers. This campaign allows advertisers to pay only for the actions that are aligned with their marketing objectives. This is a new way developed by twitter to optimize ad campaign performance. For illustration we can have an example. Earlier there was an option that a promoted tweet can be targeted at a certain number of users for a fixed cost but the company’s new advertising offer lets advertisers run “objective-based” campaigns. It will help marketers more and easily in targeting and tracking their efforts to ensure they’re receiving ROI from Twitter ads (in turn, spending more when they see results). It took almost a year for testing these ad formats over a range of small and large businesses taking from eBay to data analytics company Tableau.The result was remarkableand hence they decided to make available these valuable goal-based campaigns to all advertisers. 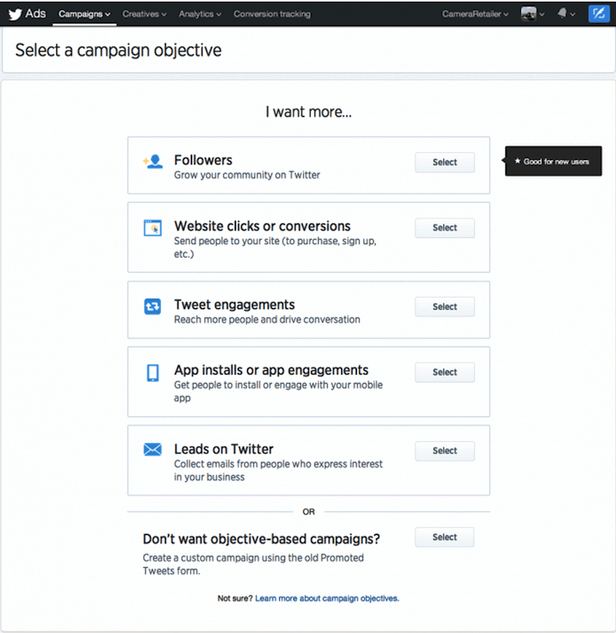 Twitter now offers six objective based campaignsto choose from which includes tweet engagements, website clicks or conversions, app installs or engagements, followers, leads on Twitter. Also a campaign “video views” is in beta mode which is expected to soon merge in live mode.